World War I was unlike anything that the world had ever seen before. The chaos, tragedy and terror of mechanized warfare, combined arms, artillery and firearms forever changed the way the world would view warfare. World War I was a rude awakening as to what the nature of war would be from now on and it would live on in infamy in the hearts and minds of millions of people. The Great War, as it was called, took the lives of millions and was a bloody and brutal conflict through and through. The end was a very welcome sight amongst all of those involved, yet the final surrender of the belligerent nation, Germany, would open the door to a long, convoluted process that would ultimately culminate in the rise of Nazi Germany. This process can be linked back to one single document: The Treaty of Versailles. 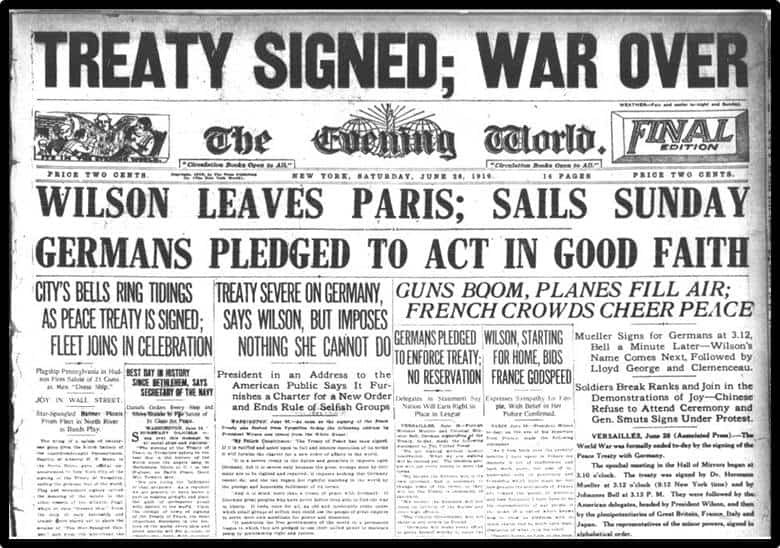 Signed on June 28th, 1919, the Treaty of Versailles was a peace treaty that had a multitude of goals and plans for handling Germany. The German state had unparalleled and unprovoked aggression towards the Balkans, sparking a long and bloody conflict that left many nations frustrated and wary of the power of the German state. Indeed, due to the long history of Germanic aggression and violence, there was suspicion and fear abounding of what Germany would do if there were no extreme restraints placed upon them. Thus, the Big Three, England, France and America, put together a group effort to solve the German problem and ensure that there would never be another war of such degree again. The Central Powers were collapsing rapidly as the Allies continued to press their offensive against the Western front and were achieving considerable success with their efforts. The German army was crumbling and it had become extremely clear that the war was over and Germany was on the losing side. The Treaty was a humiliation for the German people, as the European Allied Powers essentially decided that they would use this treaty to punish the Germans for their warmongering. A series of concessions were designed in order to impoverish Germany. One such concession was known as the War Guilt Clause, which essentially demanded that the Germany take complete responsibility for causing the war. This was a humiliation in itself and it also carried with it an immense amount of implications and requirements. It meant that Germany was responsible for all of the costs of damages associated with the war, meaning that they would be required to make reparations. The length of the war had been a brutal affair and Germany’s economy had plummeted due to having to fight a prolonged military conflict, so the reparations weren’t even technically possible at that point. Still, there wasn’t much choice for the Germans, as the Allies was adamant that if their terms were not accepted at the signing of the treaty, the Allied Powers would go right back to war with Germany. One such humiliation was the fact that Germany did not have a table at the peace talks. In Paris, France on January 18th, 1919, the Paris Peace Conference began as many nations tried to determine what to do with the belligerent states. Several different countries had the ability to speak their mind about surrender conditions, terms, and concessions, but Germany was not invited into this discussion. 27 nations in total were busy discussing the terms of another nations surrender and it was honestly more like wolves decided how to split up a piece of meat than it was a true consideration of how the treaty would affect the world at large. It was pretty clear by the end of the negotiations that punishment was essentially the key word and that meant Germany would have to be considered liable for the whole affair. There was a logic behind forcing the Germans to accept liability for the entire war. France was most worried about their proximity to Germany and knew that it would be necessary to keep them impoverished so that the Germans would not be able to muster up forces and strike at the French a few years later. France was relatively nervous and insisted on limiting the strength and power of the German army as well, another major slight that caused intense frustration within the German population as well. The restriction on the German military was relatively tight. There were limits on the population of soldiers at any given time, the military education was limited and their ships in the navy were capped at a certain size too. This was primarily more France’s doing than America’s, due to the fact that they were quite afraid of another major war. The political motivations of the three countries involved were murky. Woodrow Wilson, representing America, had a great desire for peace. He had been working hard on a concept that he called the Fourteen Points, a series of ideas and policies that would ensure there would be total world peace for the rest of all time. He essentially proposed the creation of what was known as the League of Nations, something that was the precursor to the United Nations. The purpose of this League was so that it would allow all nations to come together and cooperate with one another, preventing war and creating a forum in which argument and problems would be settled though moderation and judgement. This was an extreme ambition, and it wasn’t particularly well received by France and England, who were far more concerned with punishing Germany. Woodrow Wilson held no extreme desire to punish Germany, but knew that he was essentially outgunned by the political beliefs of the other two major powers at the table. England’s motivation was purely revenge driven, as there was a great deal of anger and hostility towards the German nation for their savagery. David Lloyd George, of Great Britain, was put in a precarious situation due to the fact that he was an elected official and the will of the people was deeply desiring to see the Germans pay for their crimes. He supported a mild amount of reparations and was primarily worried about the trade relations, as Germany had been a good partner before the war, but the publics fervor put him in a position where he was required to play the tough guy. France’s motivation, as said before, was to bring Germany to a point of no return. The idea of a militarized Germany terrified them to the point where they were willing to do anything that it took to get Germany’s military completely disarmed and for it to be incapable of fighting again. Germany was not enthused upon receiving the list of demands. So much so that the leader of their government at the time, Phillip Scheidemann, chose to step down from his position, rather than be the man who signed his name to the treaty. The next guy in line, however, was not in a much better position to negotiate and signed the treaty on the 28th of June, 1919. With the land being stripped from Germany and many countries being returned to their rightful sovereignty or being taken into custody by the new formed League of Nations, there was a great degree of controversy from the existence of such a treaty. The international community had mixed responses to these reparation demands as well as the military rules. It was seen from a lot of different perspectives, as not so much as a long-lasting peace treaty as it was simply a cease fire. And indeed, the treaty of Versailles was a cease fire. For it created a horrific cycle within Germany that would essentially cripple its economy, build up deep seated resentment and devalue the currency within the country. This would go on to create a level of agitation with the German people that would eventually translate to support for revenge against the rest of the world through an extremely aggressive war known as World War Two. This didn’t necessarily cause the second war, but it certainly helped to create economic conditions and anger that would help fuel the war machine later on. The economic cycle of the Treaty essentially led Germany to constantly be forced to borrow money in order to be able to make reparations, but the problem was that then they would have to pay back the money with interest, essentially creating a poverty cycle that would go on to damage the currency and authority of the German financial system. Ultimately the Treaty of Versailles did do little to actually help usher in a period of peace. The fact was that it treated the belligerent nations very poorly, essentially bullied Germany into submission and presupposed that it would be the best way to get all of the belligerent nations, such as Austria, Hungary and Bulgaria to play nice over the next few decades. In reality, it just caused an even higher level of tension in the international community. Europe would remain a powder keg for generations and as said before, Germany would one day rise to power on the back of that tidal wave of frustration and agitation. One byproduct of World War I and the Paris Peace Conference was the creation of the League of Nations. Woodrow Wilson had worked extremely hard to show the virtue of creating such a thing and he was able to sufficiently convince the nations of the world that a League of Nations would be necessary in order to prevent another brutal war like the one that had just happened. While he wasn’t particularly able to incorporate his fourteen points into the Treaty of Versailles, he was able to sufficiently convince many nations that the League would be a very good thing. 44 states ratified the Covenant, allowing for the creation of the League. Most ironically, however, due to the way America perceived the League. America was an isolationist country, preferring to keep its nose out of other nation’s business and the sheer fact that joining this group would require America to abandoned its isolationist views caused the country as a whole to reject it. Woodrow Wilson had worked very hard to convince the rest of the world about the necessity of the project, but he was unable to convince Americans. They had already been reticent to get involved in the first World War, after all, sending Americans to die on foreign soil over a cause that didn’t directly affect them was far too much for them to bear at the time. So, while Woodrow Wilson was awarded the Nobel Peace Prize for his efforts, he was never able to get his beloved nation to believe in the value of joining. The newly formed League of Nations took on the job of assisting countries and colonies that had been absorbed by the Central Powers by helping them return to their own sovereignty or back to their original ruler. Underneath the watchful eye of this new organization, these states would be protected by a League Mandate, meaning that the League was essentially their protector. This included states such as Belgium, Syria, and even Palestine. This essentially transferred Germany’s ownership away from these territories and redistributed them to other nations that were within the League itself. At the end of the day, the Treaty of Versailles wasn’t particularly the best type of diplomacy that could have been done by the Allied Powers. The revenge, the desire to make Germany pay and the unbending humiliation that was inflicted upon the losers of the war did so much to set back international relationships with the belligerent, that it was nearly impossible not to see that this would someday come back to bite the world on the rear. Even the greatest achievement from the Treaty, the creation of the League of Nations, didn’t particularly work out, as the League had no real power to stop any major conflicts from breaking out and was eventually dissolved once the Axis of Power showed its real teeth. The lesson was one that America, France and Britain would never forget and after the second world war, the peacemaking was designed with the idea of restoration instead of a revenge, and that was a much better policy.